Variant Comics from then ’till now – Part 6! In this multi-part series on the history of variant comics, we are exploring series of variants that collectors are likely to find, albeit some being much more difficult than others, depending on the rarity of those series. I have stayed away from the “one-off” variants of which there are many but most are rare. Part 1 and part 2 explored the first series, the “price variant comics”. In part 3, part 4 and part 5, we dug into the second series, the “printing variant comics”, covering second printings, third printings and so on. In this, part 6, we will explore the third series, the “alternate publisher variant comics”. There are only two of these, the “Whitman” variants and the “Modern Comics” variants. These variants exist primarily as a result of two publishers experimenting with the earliest stages of the “direct market”, where publishers distributed their comic books directly to stores, rather than via the most common method of distribution of the time, the newsstand market. There is still much discussion around what makes these variants and the potential inclusion of other comics in the same category. Both of these “alternate publishers” were not actually different from the parent publisher, they were merely different divisions of their main publisher with a focus on publishing and distribution of printed material other than comic books. Thus they had their own distribution system that did not rely on the newsstand market. We will begin with Modern Comics as the least complex of the two. Modern Comics published within Charlton’s massive structure for the briefest of periods 1977 & 1978. There was a random selection of Charlton Comics that were essentially reprinted by the Modern Comics publishing imprint and distributed directly to large stores. The stores would purchase the comics outright (eliminating unsold returns) and the stores could sell them individually, or package them with other products as a marketing tool. Print runs are unknown and they are relatively common. From a collectable point of view, the Modern Comics publisher variants, have not caught on. Perhaps this is due to the fact that the Modern Comics variants are essentially random second printing variants, or could even be considered reprints, often reprinted 8-12 years after the original Charlton comic. Here are 2 examples. 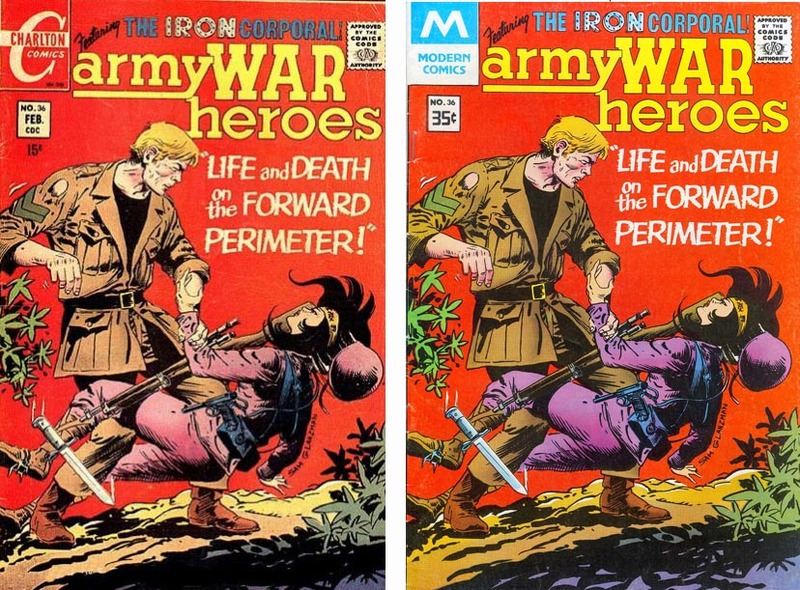 Army War Heroes #36 is a good example of the random nature of the Modern Comics reprints as it is the only issue from this Charlton series that Modern Comics published. The Whitman variants are another matter. These differ from the Modern Comics variants as they were published on the same date as their “regular” counterparts. Whitman, like Modern with Charlton, was a part of the Western Publishing behemoth, is the most successful comic publisher in history! However, event giants of the industry can fall on tough times and Western was no different. Whitman existed many years before their imprint showed up on a comic book, publishing coloring books and children’s books, sometimes using the characters where Western held the license to produce comic books. Whitman distributed their publications directly to stores, mostly department stores and did this via their own distribution network. Western published their series of comic books under the “Gold Key” logo (formerly Dell Comics) beginning in 1962. In the mid 1970s, like other publishers, Western struggled with the newsstand market and was starting to lose both market share and money. In 1975 they decided to try distributing via the direct market that Whitman used, by simultaneously publishing under the Gold Key logo for the newsstand market and the Whitman logo for their direct market. Those who normally looked for their Gold Key fix at their local newsstands began to notice that their favorite characters were appearing in department stores with a different (Whitman) logo. This arrangement continued until 1981 where declining newsstand sales forced Western to abandon the newsstand distribution and the well known Gold Key logo on comics ceased to be published. Western continued to produce comics until 1984, exclusively for the direct market under the Whitman logo. So, what about the collectible Whitman variants? Essentially from the time that Western began publish two versions of some of their comic series (1975) until Gold Key ceased to exist (1981), are the years where the Whitman variants are collectible. After this time, only the Whitman logo existed so these are not variants. Whitman publication numbers and distribution was often sporadic and, during a short period of time, the Whitman versions were only distributed in bagged 3 packs. Some of these saw limited production and distribution and are rare. It is for these rare versions that collectors began to collect the Whitman variants. 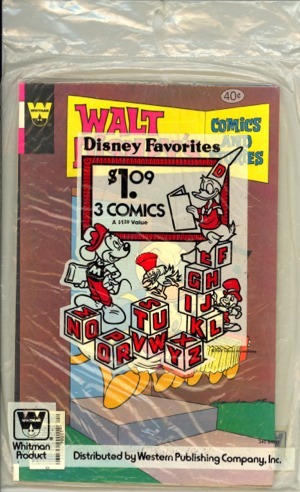 Whitman 3 pack of comics, some of these saw limited distribution and small print runs. From 1975 Walt Disney’s Comics & Stories #423. On the left, the Gold Key imprint and on the right, the Whitman. Besides publishing the Western series of comic books, Whitman also published and distributed some DC Comics exclusively in 3-packs with a Whitman logo on those covers as well as some Marvel Comics in multi-packs (most notably Star Wars reprints). The difference here is that Marvel published these reprints and used a “diamond logo” to differentiate these reprints from the original version. There is much debate amongst Whitman collectors that these Marvel issues should actually be considered Whitman variants. They may have been distributed by Whitman in multi-packs but they were published by Marvel. Here is an example of the Marvel multi-pack (Diamond logo on the covers) distributed by Whitman. 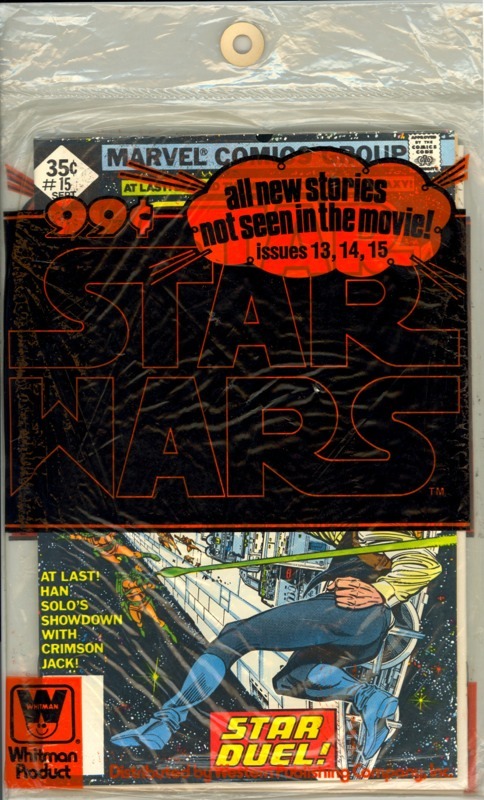 Marvel Star Wars reprints distributed by Whitman in multi-packs. Note the diamond Marvel logo! 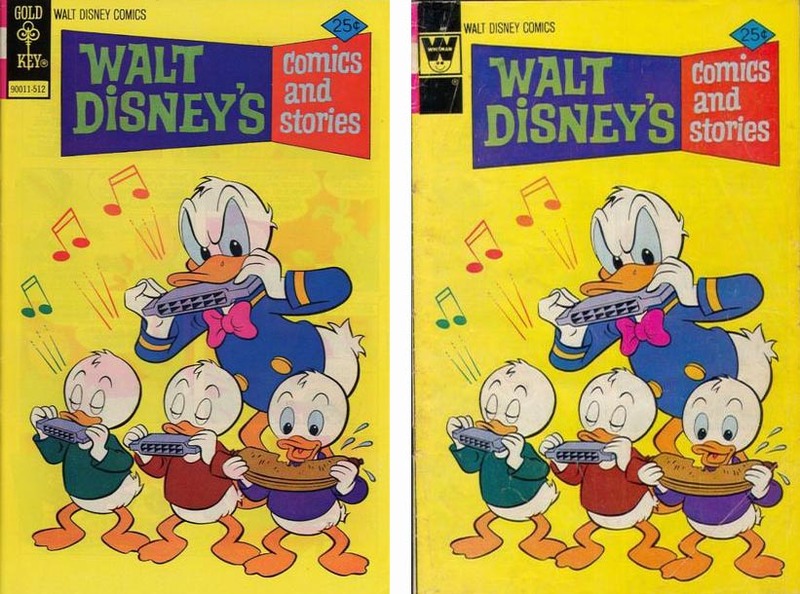 Much later, in an apparent return of the favor, some of the Disney licensed comics (post Western Publishing era) published by Gladstone, also printed a counterpart that was distributed by Marvel Comics. These are also not considered alternate publisher variants, as they merely have an alternate distribution chain, as the direct market evolved. 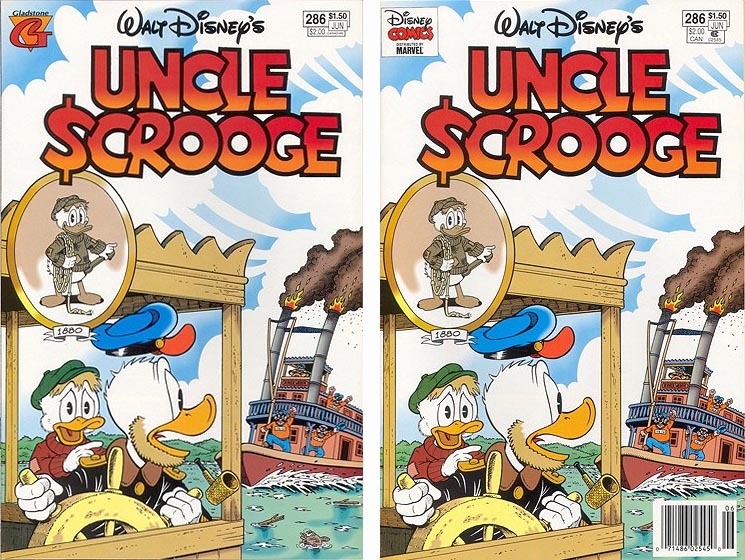 On the left Gladstone Comics 1994 Uncle Scrooge #286, on the right, the same comic with a “distributed by Marvel Comics” under the Gladstone logo! 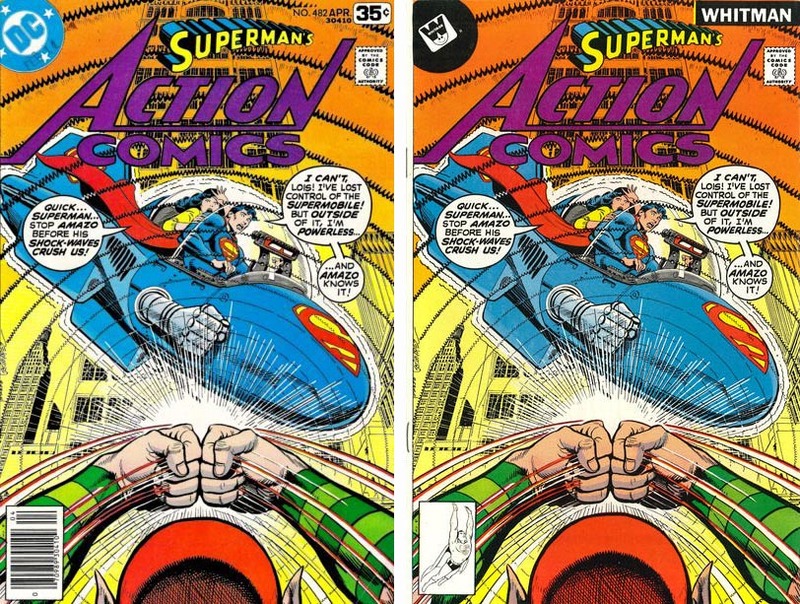 On the left DC Comics 1978 Action Comics #482, on the right, the same comic published by Whitman! 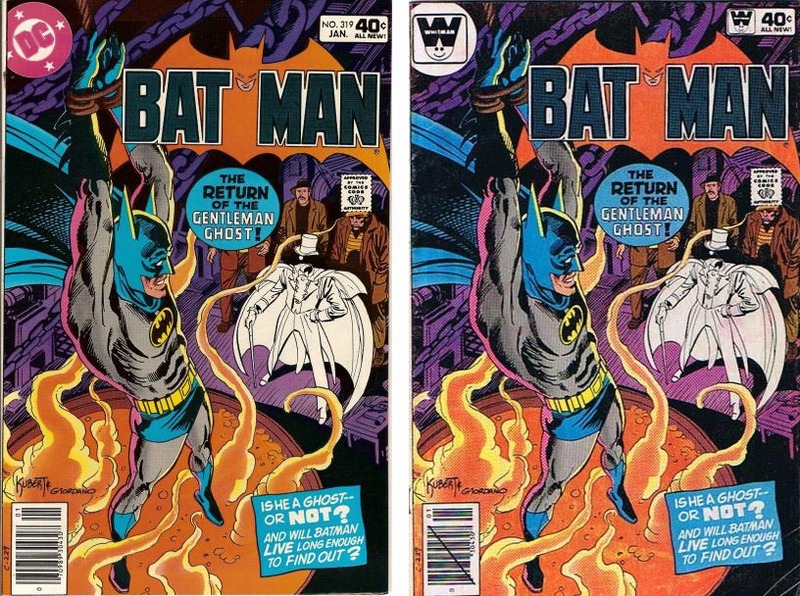 On the left DC Comics 1980 Batman #319, on the right the same comic published by Whitman! Now we are caught up with the “alternate publisher” series of variant comics. In the next part (part 7) we will begin our look at the last series of variant comics, the “cover variants”. Alternately referred to as “gimmicky covers”, “chase covers” or, “limited editions”, or a series of other unmentionable names which some completist collectors call them. We will see how their early proliferation played a part in what almost destroyed the comic book industry but, ultimately resulting in the plethora of variants in production today! Continued in part 7 part8. The History of Variant Comics Part 9 is here and is the last part of this series. 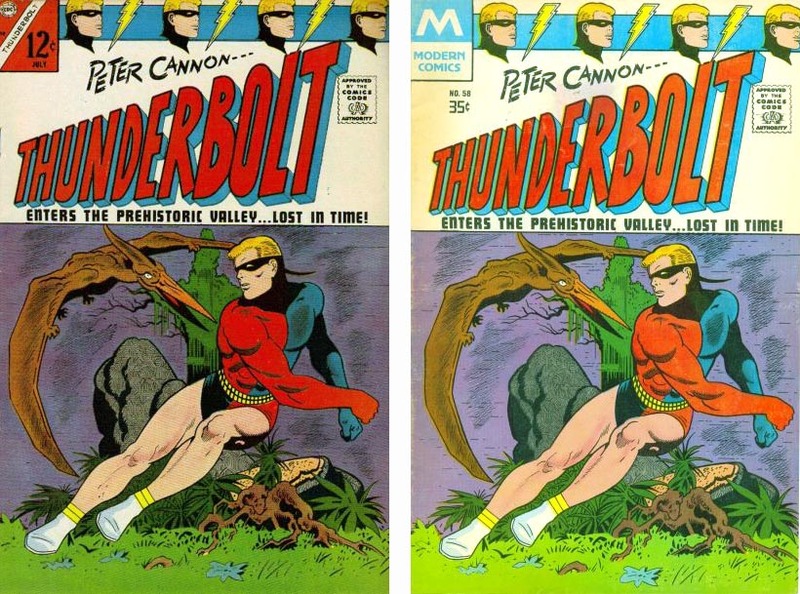 Share the post "Variant Comics from then ’till now – Part 6!" This entry was posted in Variant Covers on August 21, 2014 by Hal Hickey.